This past weekend I was on long island with Nick’s family. For those of you who don’t know, Nick is my amazing boyfriend of over three years 🙂 We spent our saturday night at his aunt and uncle’s house for a wine tasting party. The theme was French Bordeaux wines and it involved over 22 different bottles. I’m talking all different flavors, ages, and prices. It was a lot of fun and the wine was out of this world! The only problem was the food. The spread contained cheese, rare steak, and foie gras. Not my cup of tea. I am learning that I really need to bring food with me wherever I go in order to make sure there is something I will eat. After my third glass of wine, not having anything to eat was becoming a problem. My new plan is to travel with a dish I will eat and can share with everyone. Then I know I won’t be hungry and can share the love! Win-win. I learned my lesson the hard way saturday night. Although, don’t think for a minute that I did not thoroughly enjoy a night of good wine and company! 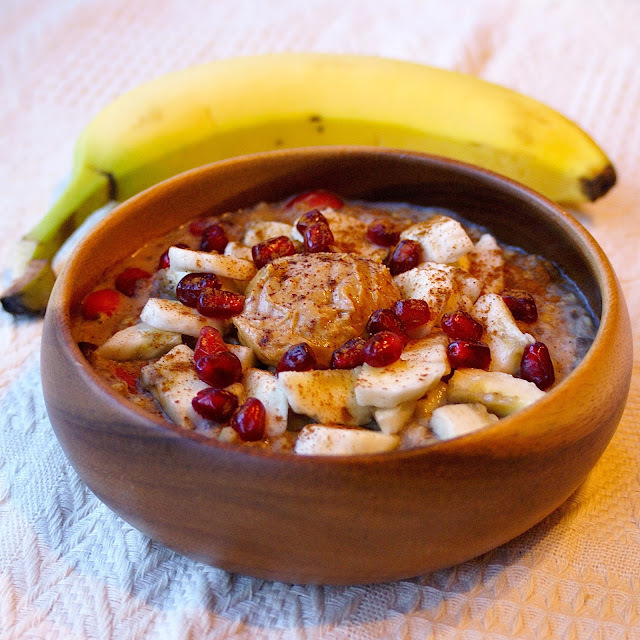 Sunday morning I woke up starving and lucky for me I brought the ingredients to make this peanut butter banana buckwheat bowl for breakfast! I scarfed down the entire recipe myself when it usually makes two servings. This is a great breakfast to travel with. Just bring a bag with all the dry ingredients, and add the wet whenever you are ready to eat it. 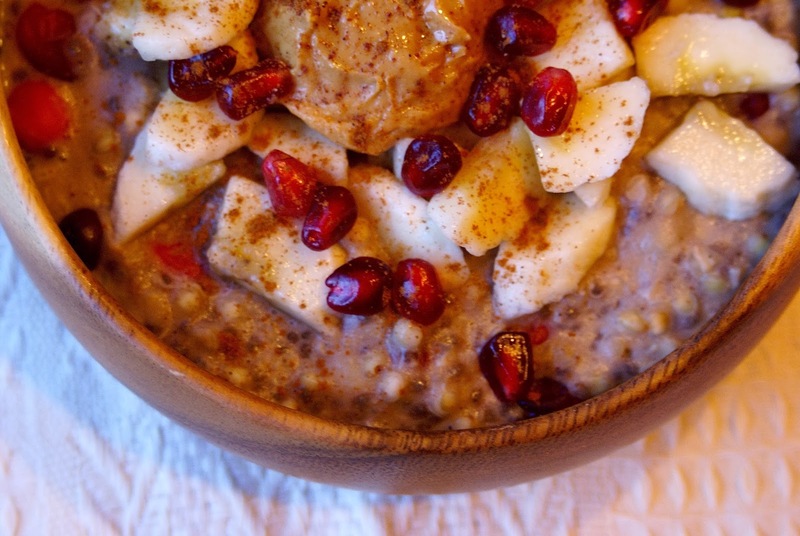 It’s a healthy, delicious, filling breakfast that is a great way to start your day! After developing a love for buckwheat flour, I wanted to try using buckwheat in it’s whole form. 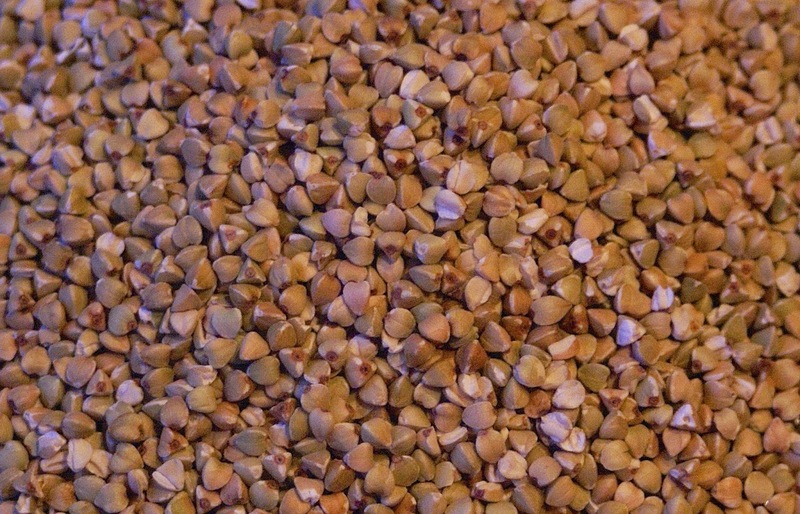 Buckwheat groats are the hulled seed of the Buckwheat plant. Although the name is deceiving, buckwheat is actually a seed, not a grain, making it naturally gluten-free. It is high in fiber, protein, and antioxidants to name a few of it’s amazing benefits. When cooked, buckwheat groats remind me of steel cut oats, with a slightly creamy and more pronounced nutty flavor. 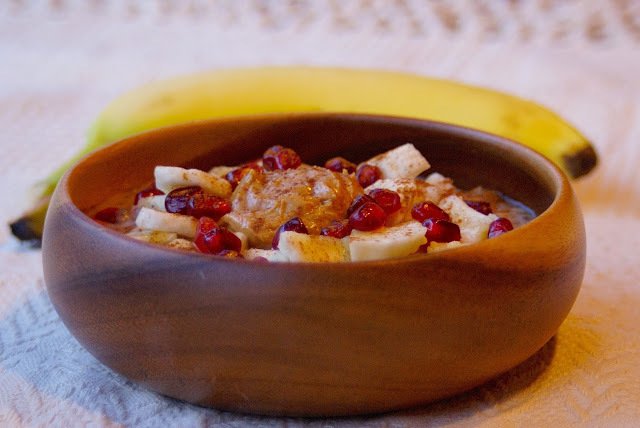 I cooked them with almond milk to enhance the creamy flavor and chopped bananas to add sweetness, adding some chia seeds for an added nutrition boost! Warm cinnamon and ginger give this breakfast bowl a wonderful banana bread flavor. I completed this breakfast with fresh sliced banana, peanut butter, and chocolate because who doesn’t love the banana-peanut butter-chocolate combination?! I actually forgot to bring almond milk and peanut butter with me this weekend so I made this buckwheat bowl with water and chopped almonds. It was still tasty! You can sub any type of nut butter/chopped nuts or non-dairy milk and still have a delicious breakfast. Don’t let my intense love of peanut butter scare you off from swirling homemade almond butter or sprinkling toasted walnuts on top of this delicious breakfast! Rinse buckwheat groats well. 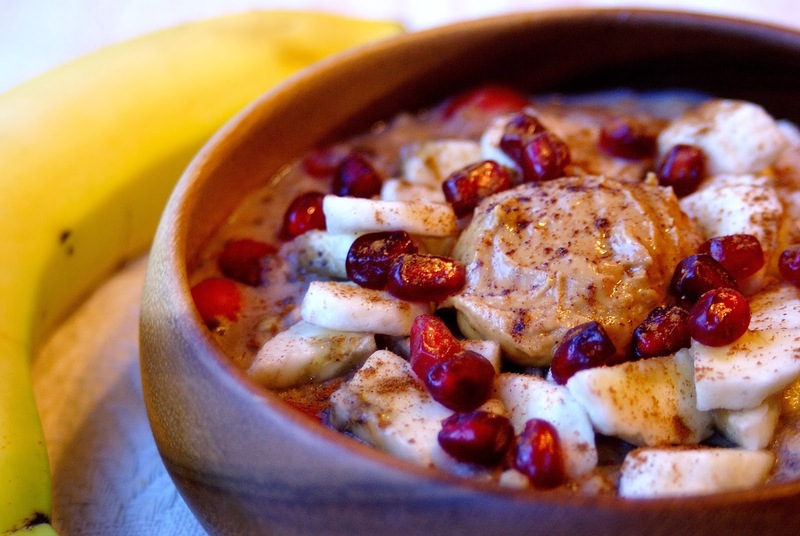 Bring buckwheat, almond milk, vanilla, chia seeds, cinnamon, ginger, and nutmeg to a boil. Add 1 chopped banana. Cover and reduce heat to a simmer for 15-20 minutes, or until all the almond milk is absorbed. Stir in chocolate and other chopped banana. Add a dollop of peanut butter and sprinkle with cinnamon. I'd like to try this. Do you think it would cook faster if you blended the groats into a flour first? I have never tried that, but I do think that would cut down the cooking time considerably. If you don't have much time in the morning, you can mix everything together the night before, and let them sit in the fridge overnight. In the morning, simple heat them up and add toppings of your choice! The peanut butter really makes this bowl for me. I used dried bananas from my stash in the cooking and topping part, and I liked that also. For my small breakfast stomach, this was three days worth of breakfast and it kept well in the frig. ohhhh dry bananas sounds wonderful! !